KANSAS CITY, Mo. - Salvador Perez shouted at Hunter Strickland, who shouted right back. The Kansas City Royals streamed from their dugout, the San Francisco Giants from their own. And for a tense moment in the sixth inning Wednesday night, Kauffman Stadium was consumed by chaos. The one thing that was clear? The World Series suddenly had some life. Perez broke open Game 2 with a two-run double in a five-run sixth, and the Royals' cast of clutch relievers kept the Giants in check for a 7-2 victory that evened the Series and spiced things up as it shifts to San Francisco for three games. "We showed them that we have fight in us, and I think they knew that already," said Billy Butler, whose RBI single in the sixth inning gave the Royals a 3-2 lead. "But we stepped up big there as a team, and that gave us some confidence." "With their pitching and our pitching, and the way both teams play, we're going to have a fight, I think, every game," Giants manager Bruce Bochy said. So much talk of fighting after the two teams nearly came to blows Wednesday. The Royals had surged ahead on Butler's single when Perez followed with a double off Strickland into the left-field gap. Omar Infante then scorched a pitch into the bullpen in left, the fifth homer that Strickland had allowed to 23 post-season batters. Boiling over with anger, Strickland yelled into his glove then got into a shouting match with Perez as the big, burly catcher headed for home. Players spilled out of both dugouts, and several Royals streamed in from the outfield bullpen before the umpires finally restored order. "He started to look at me, so I asked him like, 'Hey, why you look at me?'" Perez said. "So he was telling me, 'Get out of here, whatever.' So I don't know. 'You don't have to treat me like that. Look at Omar. Omar hit a bomb. I didn't hit a bomb. I hit a double.'" Strickland said he simply let his frustration get to him. "I let the team down," he said. "My emotions got to me." With his 100 mph fastball singeing the Giants' batters, Royals flamethrower Yordano Ventura allowed two runs while pitching into the sixth inning. The 23-year-old protege of Pedro Martinez hardly looked like the first rookie to make a World Series start for the Royals, calmly handling a lineup that had ravaged staff ace James Shields. Herrera got the final two outs of the sixth to escape a jam, his first three pitches clocking at least 100 mph. He also survived a shaky seventh before Davis breezed through the eighth. Greg Holland, who saved each game in the Royals' sweep of Baltimore in the AL Championship Series, allowed a two-out single to Brandon Crawford before fanning Gregor Blanco to end the game. The Giants' only runs came on a homer by Blanco and a double by Brandon Belt, their streak of seven straight World Series wins ending on a crisp, breezy night. "For us to leave here with a split, you like to get greedy," Bochy said, "but we know it's going to be a tough series." Early on, it looked as if the Giants could have a big lead heading back to the Bay Area. The fleet-footed Blanco silenced a rollicking sea of blue, becoming the 10th player to open a World Series game with a home run. He deposited Ventura's 98 mph fastball in the bullpen in right field, just his 17th home run in more than 2,300 at-bats. 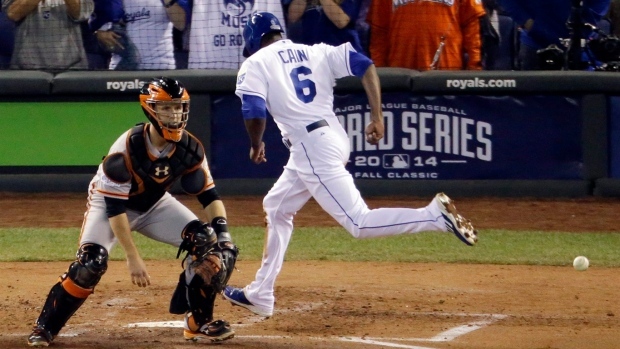 ALCS MVP Lorenzo Cain stretched a two-out double later in the first, and Eric Hosmer walked on four pitches. Butler, Giants starter Jake Peavy's long-time nemesis, then bounced a single past the outstretched glove of Crawford at shortstop to knot the game 1-all. The Giants, so accustomed to October baseball, refused to back down. Belt tied it in the fourth with a double that bounced off Nori Aoki's glove in right field. The game was still knotted at 2 when the Royals got their first two batters aboard in the sixth. Bochy pulled the fiery Peavy. Butler promptly hit a go-ahead single off Jean Machi, and Strickland came in two batters later. The Giants matched a Series record by using five pitchers in one inning. The other teams to burn through as many pitchers did so in Game 7 losses: The Cardinals against the Royals in '85, and the Orioles against the Pirates in 1979, according to STATS. Giants: Hudson has appeared in 12 post-season games and started 11 of them, first with Oakland and then Atlanta. But he's never been on the mound in the World Series. Royals: Guthrie, an 11-year veteran, did not pitch in the Royals' sweep of the Angels in the ALDS. He made his first career post-season start in the ALCS against the Orioles.